superb amenities, outstanding service, and 18 holes of magnificent golf. We offer exceptional everyday pricing in addition to weekly and daily specials. Village Green is now open for play during the 2019 golf season! Clubhouse hours (effective 4/1/2019): 8am - Dusk (weather-permitting). Please call (847) 566-7373 for reservations! Next Fish Fry is Friday, April 5th from 4:30-8pm! View our inventory and book your round today! Learn more about booking your outing at Village Green today! Check out Village Green's own Bar & Grill! Village Green will be open for play during the 2019 golf season! Please call the pro shop at (847) 566-7373 for reservations. Clubhouse Hours (effective 4/1/2019): 8am - Dusk (weather conditions permitting). Next Friday Fish Fry is Friday, April 5th from 4:30-8pm. 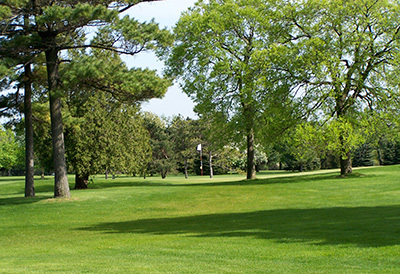 Just a chip shot longer than 6,000 yards, Village Green Golf Course has been operated since 2008 by GolfVisions, a Chicagoland-based firm known for meticulous conditioning and attention to detail at its leased and managed facilities. GolfVisions restored the course's bunker contouring and implemented dramatic clubhouse upgrades. Our emphasis on excellent customer service, combined with sports-bar ambiance and delicious fare in the clubhouse, makes Village Green the choicest venue for leagues and outings.